When we are invited to my husband’s sister’s house, I usually offer to bring a salad and dessert. When I think of it, that pretty much sums me up, and I’m smiling because I’ve never thought about it quite like that before. I love salad and vegetables, and I enjoy making dessert. Often those are the two items people may not have time to make when they’re putting a big dinner together, so I also like to think that my contributions lighten the load a bit. If you really know me, you’re thinking she just needs guinea pigs for her experimental cooking and you’d be exactly right. But since this past weekend we were celebrating Easter and there would be two very cute little kids there, I decided to make cupcakes. 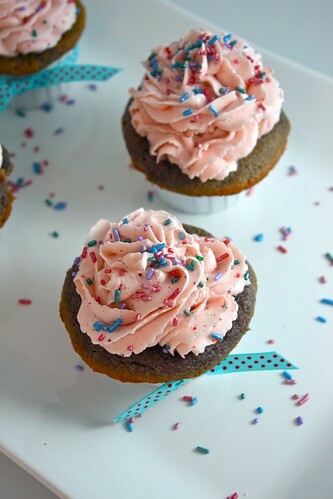 Fluffy, frilly, sprinkly cupcakes. 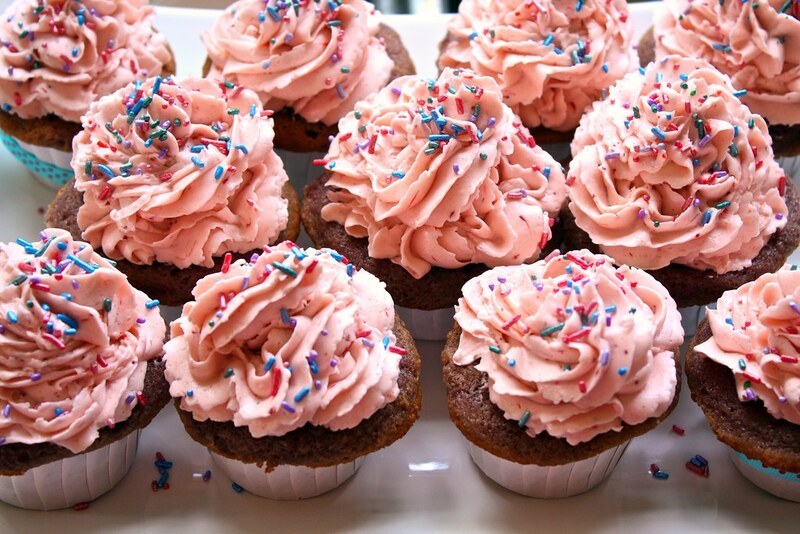 Pink cupcakes. Hopefully my nephew would see past the color and focus on the flavor? Right about the time I was finished decorating and positioning the cupcakes for photos, it occurred to me that I’d have a problem getting them to our destination in pristine form. I’d blame this on bad planning, but it’s more a case of cerebral flatulence. Usually, I’m fine carrying whatever it is I’ve made while my husband drives, making sure that while we’re on our way, going down steep hills or around corners doesn’t cause everything to slide around. But my husband was at work last Saturday, and we’d agreed that I’d pick him up on our way. Just a bit of a problem. I drove carrying a plate of these lovelies held like a waitress carries a tray just waiting for someone to see me and think oh jeez, now I’ve seen everything or ask if they might sample one as they pass by in the cross walk. I was semi-successful getting them to their destination with only a couple of mishaps barely noticeable by my darling little niece who greeted me at the door all dressed in pink. To make the strawberry puree, remove stems and slice the berries in half. Place in a small sauce pan and sprinkle with sugar to let sit while you measure out your other ingredients. Then cover the pan and heat the berries over medium heat until soft and syrupy. 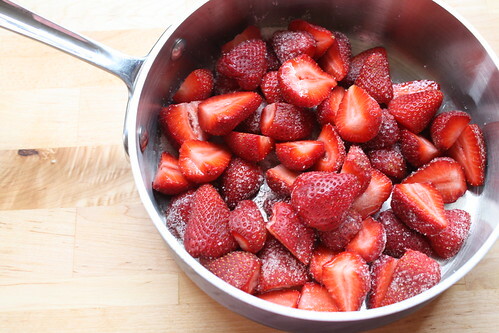 Using a hand blender, food processor, or blender, puree the strawberries in their syrup and set aside to cool completely. 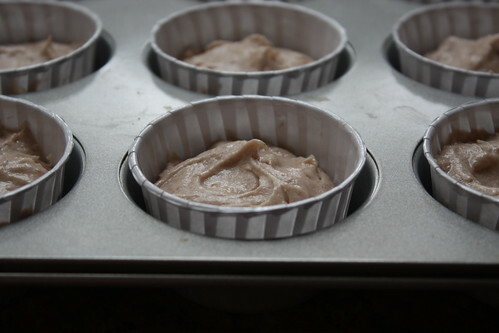 To make the cupcakes, preheat oven to 350 degrees F and line a standard 12-cup muffin tin with paper cups. Whisk the dry ingredients together and set aside. In a separate bowl, mix cooled strawberry puree and milk. 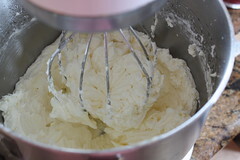 In the bowl of your mixer, beat butter on high until soft, about 30 seconds. Lower speed to med-high add the sugar, beating until light and fluffy, about 3 minutes. Add the eggs one at a time and beat for 30 seconds between each. Add about a fourth of the flour mixture to the bowl and beat to combine. Add about one third the milk/strawberry puree mixture and beat until combined. Repeat, alternating between dry and wet ingredients and ending with the flour mixture. 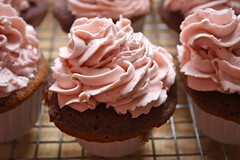 Spoon into cupcake liners about half to three-quarters full (depending on whether you want flat or domed cupcakes). Bake for 20-22 minutes, or until a cake tester comes out clean. Allow to cool in the pan for a few minutes before removing to a rack to cool completely. To make the buttercream, in the bowl of a mixer, beat the butter until creamy and scrape out into another bowl to set in a cool place. Wash mixing bowl to remove all fat. In a heavy saucepan, heat 3/4 c. sugar and the water, stirring until the sugar dissolves and the syrup begins to bubble. Reduce the heat to the lowest setting or, if using an electric cooktop, remove from the heat. In the clean mixing bowl beat the egg whites until foamy, then add the cream of tartar. Beat until soft peaks form, then gradually beat in the remaining 1/4 c. sugar until peaks are stiff. Return to the syrup and turn up the heat. Boil until a thermometer reads 248 degrees F and immediately pour the mixture into a heat proof measuring glass to stop the cooking. 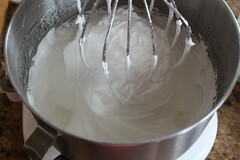 With the mixer on high, pour a small amount of the syrup into the meringue at a time, mixing about 5 seconds before adding more. Be careful not to pour the syrup against the beater or it will harden on the beater and sides of the bowl. Scrape remaining syrup from the glass measure into the meringue and continue beating on medium for at least 5 minutes or until it is completely cool to the touch. Now add the butter 1 T at a time, beating between additions until incorporated. If the mixture begins to curdle, stop adding the butter, turn the mixer to high and beat until it smooths out again before resuming adding butter. When all the butter is incorporated and mixture is smooth, slowly pour in the strawberry puree and mix until smooth again. Drizzle in the cointreau if you wish. 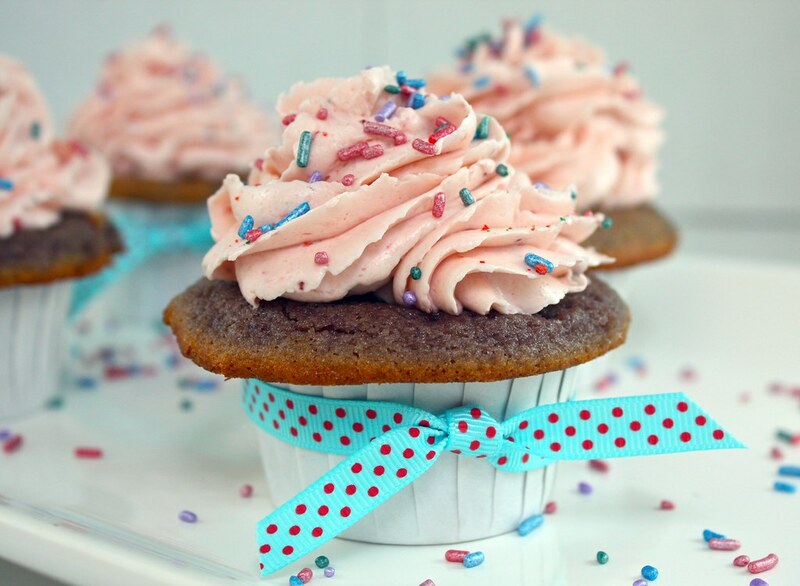 Spoon into a piping bag and ice the cupcakes. The sprinkles for these cupcakes came all the way from Ohio. I bought them in a cute little bake shop when I was visiting Lis last November. I had to have them because the color combination reminds me of Monet’s Waterlilies, my favorite painting. The pink takes away a bit of the effect, but they’re pretty festive. I was going to wait until Mother’s Day to use them but couldn’t stand it any longer. Just wait. I’ll sprinkle them on everything since they’re like spring time in a bag. The paper cups are courtesy of Helen who gifted me with a little pack since I was always bugging her about where she got them. These were pretty good, but not as good as these. To be fair, though, I only got to taste the batter on the last strawberry batch I made. Maybe it was the banana in the frosting in the other recipe. I always love strawberries and bananas together. Mmmm…. Fun to experiment. The cake recipe here was flavorful and moist, but in filling the cups 3/4 full as directed for a mounded cupcake, they only flattened out and over the tops of the cups. Grrrr….They look more like muffin cakes. They baked for 25 whole minutes in a non-convection oven. I tried to take them out at 20, but wasn’t quite sure they were done. They’re a bit sticky and remind me somewhat of a sponge texture. Funny considering the egg content isn’t that high. 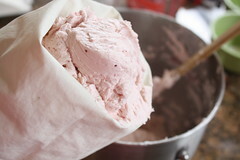 The strawberry puree is easy to make a lot of and just freeze in bags. The quantities aren’t exact, and you should have left overs from this to freeze and perhaps make something else with. The mousseline recipe is adapted from Rose Levy Beranbaum and is one I enjoy. Yes, it’s an amazing quantity of butter, but how many cupcakes are you going to eat? Okay, how many should you eat? One. 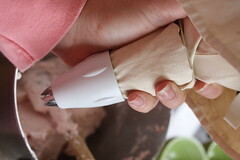 Beranbaum mentions that if you’re using a hand held mixer, then add the hot syrup in a steady stream while mixing. I do that with my Kitchen Aid, also, but am very careful to drizzle the syrup directly into the meringue away from the beater. Yes some of it gets on the side of the bowl, but not that much. The mousseline will look like it’s curdling when you’re adding all that butter. Just follow the directions and keep going. It will come back together again. This is a dream to pipe even when you’re as rotten at piping as I am. It also holds up quite well at room temperature (65 degrees F) if the room is cool so there’s no need to refrigerate even if they’re going to be out for hours.